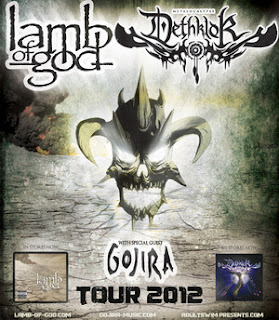 Games Meet Metal: 8-bit Metal Mondays: Lamb of God, Dethklok, and Gojira to tour together? SQUEEEEE!!!! 8-bit Metal Mondays: Lamb of God, Dethklok, and Gojira to tour together? SQUEEEEE!!!! Oh sweet Satan it's 100% true! All three bands will be hitting the road together, and it's actually an interesting mix. Pure American metal with a French bent and total silliness. Hey, works for me. Plus, it's rolling through Michigan! Now, if they just chose a better place than Compuware Arena, it would be perfect! So, to commemorate one of the big summer tours, here's some bleepiness from all three bands. Also, tour dates after the jump. Holy hell I can't wait for this show! 2012 is shaping up to be one of the greatest years for concerts in history.